In the frame of discretionary mandates, IAM utilises its know-how and its in-depth knowledge of the Emerging Markets for a mandate investing in this region. The management of this mandate is done through a top-down approach (macroeconomic analysis, global approach to the market). Due to their number, the geographical distance and cultural differences, emerging markets are huge and complex markets to analyse. It would therefore be illusory and risky to adopt a strategy based on sectors and companies (bottom up). 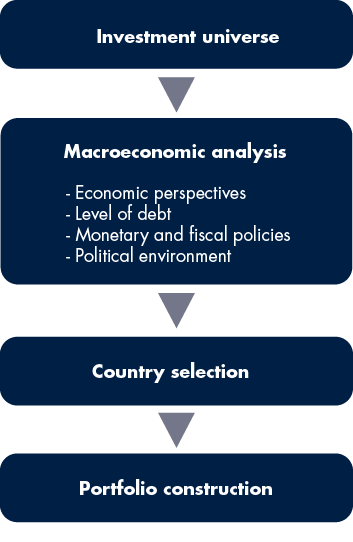 The geographical allocation is therefore achieved by analysing macroeconomic factors (debt level, monetary and fiscal policies, trade balance…) The fund is composed of baskets of securities (“ETFs”) which replicate stock exchange indices of emerging countries such as Brazil, Russia, India, China, Mexico, Korea, Taiwan, Thailand and South Africa. In addition to a rigorous fundamental analysis of the different countries, our analysts attend regularly seminars related to Emerging Markets. IAM has over time become a recognised specialist in institutional asset management. We manage various mandates with the requested risk profile, compliant with the legal framework for Swiss pension plans.